Jessica Norris began her undergraduate career in Edmonton, Alberta at a local college where she was first exposed to Earth Sciences. After taking the introductory courses, she transferred into the Geology program at the University of Alberta. Jessica's summer jobs during her undergraduate career consisted of research with the meteorite collection at the University and instructing rock climbing. Upon graduating in 2006 with an Honours degree in Geology, Jessica moved to Whitehorse, Yukon Territory to work for Aurora Geosciences Ltd., a geological and geophysical consulting company. 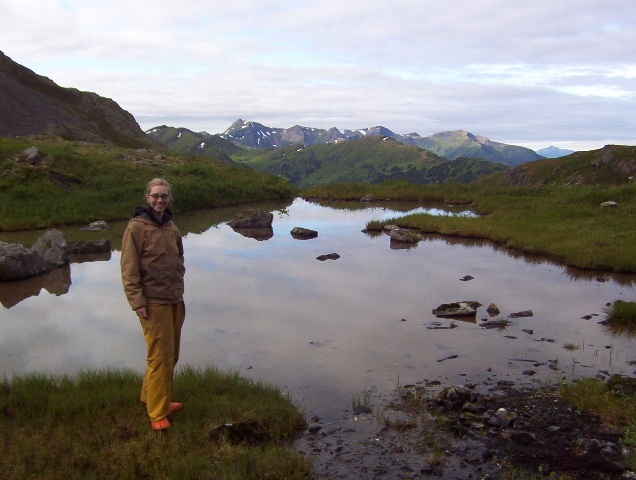 Over the next two years Jessica worked as a geologist and geophysical technician at various exploration camps across Northern Canada and Alaska, including the Greens Creek Mine near Juneau, Alaska. One consulting job sent Jessica to work in Siberia, an area of familiar looking landscape but a different and exciting culture. Jessica spent most of those two years logging core and supervising small drill programs of various deposit types. In the spring of 2008 Jessica started on with Overland Resources Ltd., an Australian-based company with a lead-zinc project in the Yukon. As like many geologists involved in mineral exploration, Jessica was left looking for a new job in the fall of 2008 and she decided that graduate school was one avenue to explore. In January 2009, Jessica met with Craig Hart, the newly appointed director of the Mineral Deposit Research Unit, and decided that she would apply to the University of British Columbia to begin a Masters degree. Jessica's goals are to have a long and productive career in mineral exploration, to advance the current knowledge regarding mineral deposits and help find new economic resources. The Red Chris Cu-Au porphyry deposit is located in northwestern British Columbia near the northern extent of the Stikinia terrane. This silica-saturated alkalic porphyry contains several generations of carbonate material, an unusual occurrence in such a deposit. In 2007 Imperial Metals Corp. conducted a deep drilling program to examine the deposit down to 1 km depth. Drill hole RC07-335, a vertical, 1029 m deep hole intersected 1.02% Cu, 1.26 g/t Au and 3.92 g/t Ag over the length of the hole. This indicated that significant ore mineralization was located at previously untested depths, beneath the original ore-model. The scope of the study at Red Chris is to define the evolution of the East Zone, involving the paragenesis, mineralization and alteration. Mineralization at Red Chris is hosted within quartz stockworks and veins dominantly as chalcopyrite and bornite. Gold mineralization occurs as microscopic inclusions within the copper-sulphides. The K-silicate altered core has been highly overprinted by later illite-kaolinite+/-sericite+/-chlorite+/- carbonate alteration assemblages. The main objective of this study is to examine the relationship between mineralization and alteration assemblages at the deposit with the goal of developing and applying exploration vectors to find similar deposits in the region.